Imagine taking any printed publication like a book, magazine or newspaper and exactly duplicating it in 3D space, correct down to every detail with rich graphics, fluid turning pages, full scalability, clear page layout, and sharp readable text. A 3 dimensional graphical publication would be the ultimate step in the evolution from print to screen. Publishers would customize 3D publications as hard cover books, paperbacks, glossy magazines, newspapers or directories, and make selections on paper textures, covers, bindings and dimensions. Their goal will be to perfectly reproduce their print titles in 3D and offer them as an alternative to their subscribers. Print publishers will love 3D publishing because it preserves the integrity of their medium, not just for them but for their readers and advertisers too. The Virtual Publishing Company has a vision to create a practical publishing interface in 3D and has been researching the concept for several years. Research has focused on building fast and efficient algorithms to process turning pages and sharp, readable text in a continuously moving environment. The 3D graphical publication interface described here is a ‘work in progress’ research project and descriptions of the advanced 3D page turn and font engine algorithms are below together with downloadable demonstration research models. The Virtual Publishing Company has existing 2D turning-page publication technologies in the market and the editing tools to create them. These have the most advanced page-turn animations in use as well as internal scalable sharp text typesetting and rich text formatting capabilities. They are capable of duplicating any print publication. 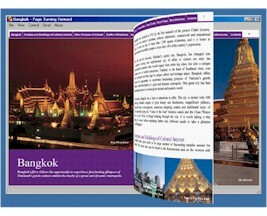 Already thousands of magazines, brochures and directories have been created and published in this format. 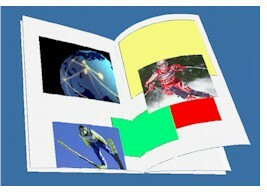 The Virtual Publishing Company is at the forefront of 3D Graphical Publishing Interface Metaphor research. The concepts, methods, algorithms and progress are summarized here.